Last night, I replaced a worn front tire on my Valkyrie for peace of mind and just to play it safe. 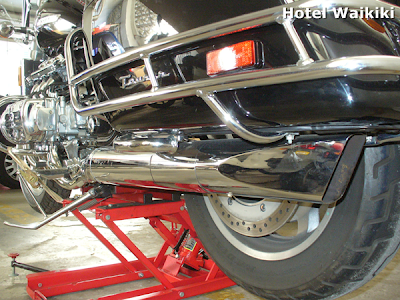 A healthy layer of rubber on the front tire is vital because the front tire on a motorbike is the lead foot. Moreso during a turn. While the rear tire remains the lessor of two evils. 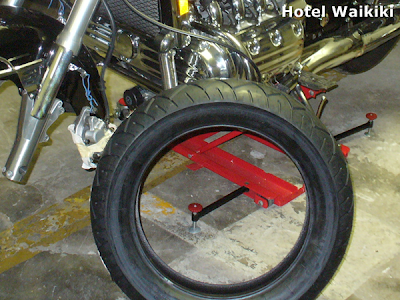 The new tire below is a well known Metzeler brand motorcycle tire manufactured in Germany. I already have a Metzeler on my Honda Shadow 600 and it outperforms the factory Dunlop by a mile, but we'll see how the same tread design works out on a larger 800-lb. bike. Also, after I was all pau (finish) installing the tire on the wheel, I went to the service station to fill it up with air because I don't happen to own an air compressor, and the freakin coin operated air machine was 75¢. For air. And yeah I agree. Inflation. My brother would go nuts over this post. He's always ridden a motorcyle. He also doesn't wear a helmet which makes me CRAZY! Wow! You got some really fancy bikes there. Kay- people with helmets generally ride too fast. Take for example, if they took out the windshields in cars, very few would exceed the speed limit in comfort. Hmmm... that's still not reassuring me. Kay- not solely due to irony, but it's against the law to wear a helmet while driving a car.